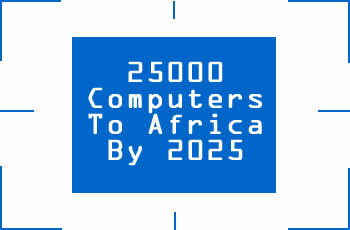 The aim of this operation is to install 40 000 computers in African High Schools by 2020. PC's are usually no more than 4-5 years old and perfectly able to run for another 4-5 years, depending on the climate. We achieve this through partnering with major institutions and corporate partners to re-use their written-off and other redundant hardware by making it available to Africa. Our main goal is to revitalize the declining secondary education in our continent. And the success of the currently running projects proves beyond a doubt that this goal to provide cost-efficient state of the art education to African countries within a small time frame is manageable. The lack of means and infrastructures is the major problem of secondary education in Africa. There is a gap between Africa and the rest of the world in secondary education because only a few young Africans have the opportunity during their cursus to seat in front of a computer. Tackling shortcomings in the African educational system, our projects are a concrete and well-received means to help Africa on its way into the future. It offers the opportunity of improved connectivity for African societies, not only towards the developed world but most importantly to its African partners. It is therefore able to give Africans the tool to participate in an increasingly globalised world. We clearly need the contribution of us to break the mould. Whatever is the quantity of IT equipment you can give, we have the necessary logistic and we are happy to arrange for a convenient time for collection. Have you already checked what is your office policy about IT equipment re-use ? Do they know our project ? It's time to make some lobbying towards the IT department. To donate IT equipment, click here.